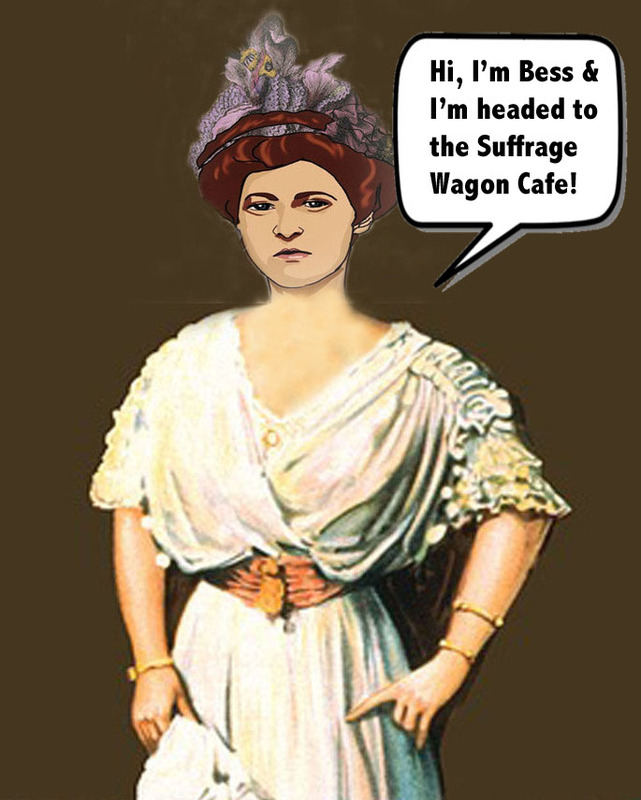 Alice & Tea at the Suffrage Wagon Cafe: A Kickstarter for suffragist Alice Paul! The Suffrage Wagon Cafe is open. Join us for women’s suffrage history, events and issues! on Vimeo. LAUNCH THE KICKSTARTER CAMPAIGN FOR A NEW PROGRAM ABOUT SUFFRAGE ACTIVIST ALICE PAUL ! We always had a little tearoom, always at our headquarters. Miss Alice Paul. 14 Jackson Place, The Woman’s Party Headquarters 1917 – 1922 had full view of Mr. Wilson’s White House, just across Lafayette Square. As the Silent Sentinels guarded the many White House gates, they took rest and planned a revolution over a cup of tea. Sewing torn banners, warming feet, drying off and taking a short respite; more than tea was being served. It was the birthplace of Non-Violent Direct Action in the United States. This multi-media stage presentation is a TED talk on steroids. It is both historic and current. It is the astounding story of one woman’s life and how she was intentionally redacted into obscurity by jealous and disapproving moderates. It is a story about a small Quaker woman who carried a fire for Equality that could not be extinguished – no matter the defeats, the rise and fall of public opinion or her declining age. March, 4, 1913 – as the first person to create a march to the White House, the architect of the successful radical suffrage campaign and the woman whom so few could identify from a photo; knowing her is not merely gift but a call to action. A true strategic genius and strident leader. She did not suffer fools but women were drawn to her for one simple reason, she knew what had to be done. Finally, after studying, writing and speaking about Miss Alice Paul for almost 40 years, Zoe Nicholson, standing in Alice’s shadow, proclaims our legacy and lights a newcomer’s torch. Zoe believes that this intentional invisibility needs to end, Alice needs to be brought into stark relief, with all her faults, all her cultural limitations and elevated to her proper status. The loss of Alice’s imprint has robbed us of this true American hero. The program features, the master story-teller, Zoe and the hundreds of photos she has collected over the years demonstrating Non-Violent Direct Action. VISIT HER WEB SITE ABOUT ALICE PAUL AND HER LABOR OF LOVE! From: Martha Wheelock, ED Wild West Women Inc.
Wild West Women. We make films. Films about women. The Centennial of the 19th Amendment and all the various events that led up to August 26, 1920 are now being celebrated across the country. Most recently we marked the death of Inez Milholland. One hundred years ago suffrage activists marched into Statuary Hall for Inez’s national memorial –a significant first for women. Inspired by the 1,000 women carrying banners up the steps and under the leadership of Alice Paul, the National Woman’s Party began standing in silence, holding suffrage banners, around the White House, January 10, 1917. Wild West Women, Inc. is proud to produce a new and innovative program, Tea with Alice and Me; written and presented by Alice Paul scholar, Zoe Nicholson. This multi-media stage production, narrated by Zoe is personal, political, insightful and inspiring. She not only illustrates the 9 decades of Alice’s activist life but establishes direct parallels to current protests, demonstrations and strategies. Now, more than ever, we need to embrace our legacy as activists. We need to treasure and exercise the VOTE. We need to bring our radical political women into national prominence. Women and girls will find leadership and strength in the great Alice Paul. declare her strategic genius and arm ourselves with relentless courage. We need Alice Paul’s legacy in these times. Two years ago, assistant producer on the film, Inez Milholland ~ Forward into Light, Zoe Nicholson began work on a script for a full stage presentation about Alice Paul. Zoe, herself, (and we as eavesdroppers), is the interlocutor with “Alice Paul.” Zoe has been researching and “living” with Alice Paul over several decades. Zoe is more than a scholar and academic; she is imbued, absorbed and obsessed, the way one has to be to get at the heart and head of Alice Paul. Since 1980, Zoe has been more than studying Alice Paul, she has been using her tactics and teaching others about Non-Violent Direct Action. 1982, for 37 days, Zoe herself fasted at the Illinois State House for the ERA, as Alice Paul did for Suffrage. I have attended four presentations by Zoe on Alice Paul and Zoe holds an audience mesmerized while delivering profound understanding not only of Alice Paul but also of inspired activism. Zoe lifts her audience from any chronological biography to the application of activism, drawing parallels from what is practiced today to its point of origin, Alice Paul. Stories draw us in as she tells us about the scheming, the long commitment and Alice’s resolute demand for Equality. Not only will this Kickstarter Campaign provide the resources to mount the program, Tea with Alice and Me, it will be used for the professional multi camera filming, with professional sound recording the presentation. This will be used to promote the live presentation, guarantee that this rich history lives in public record and lift Alice Paul to her rightful status as the Founder of US Non-Violent Direct Action, militant suffragist and author of the ERA. It will be available for schools, colleges, libraries and public television. NOW more than ever, we need to embrace women activists. Americans need to know that Alice Paul founded Non-Violent Direct Action to the U.S. Every day Americans turn to study the tactics of Gandhi when we could be listening to our very own Alice Paul. From Tar Sands to Charleston, from North Dakota to Ferguson, from Reproductive Justice to Immigration, there is no doubt that understanding and interpreting the methods and heart of Miss Alice Paul would raise the conversation and inspire women and girls, men and boys, all those who seek to create change through peaceful Non-Violent Direct Action. One day Alice Paul will be recognized as the first American to use Non-Violent Direct Action, Civil Disobedience and political protest within a political movement and I hope I will be one of the instruments of that righteous occasion. Happy birthday, Suffrage Wagon News Channel!